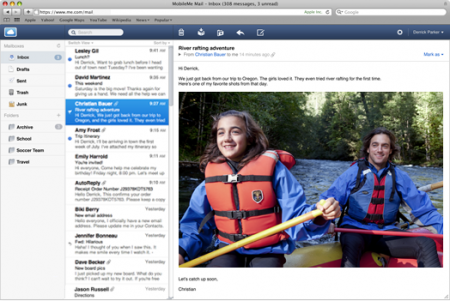 Apple has launched the new interface for their MobileMe Mail service. Faster performance. Mail at me.com loads your inbox and messages faster. And with interface refinements such as the ability to scroll through your entire inbox without having to manually click to load the next set of messages, you’ll be able to work more efficiently. Increased security with SSL. With MobileMe Mail, accessing your email on the web is more secure than ever. Your inbox is protected to prevent anyone from eavesdropping on your webmail. As always, you receive SSL protection when you use your MobileMe Mail account on your iPhone, iPad, iPod touch, Mac, and PC. Support for external email addresses (new since the beta). Reading all your email in one place is easy with MobileMe Mail. You can receive email from another service by having the email forwarded to your me.com address. * And when you reply to a message using webmail, you can choose to send it from the address it was sent to, or from your MobileMe account. Improved junk mail filtering (new since the beta). MobileMe Mail places suspected spam messages directly in the Junk folder. If you see an email that you actually want, click the “Not Junk” button on me.com. MobileMe moves the message to your Inbox and makes sure that messages from that sender are not sent to your Junk folder again. Source: The New MobileMe Mail. Now Available to All Members on Apple’s website. I don’t understand why the quick reply in inbox is no more active. It was very useful; can’t understand why apple opted to remove this feature.